At the General Assembly meeting last night, Occupy Wall Street’s dreamer contingent got a very special valentine: the GA endorsed the Direct Action Working Group’s proposal to call for a general strike on May Day—May 1, 2012. Occupiers celebrated with cheers and Valentine’s Day balloons. May Day 2012 Occupy Wall Street stands in solidarity with the calls for a day without the 99%, a general strike and more!! 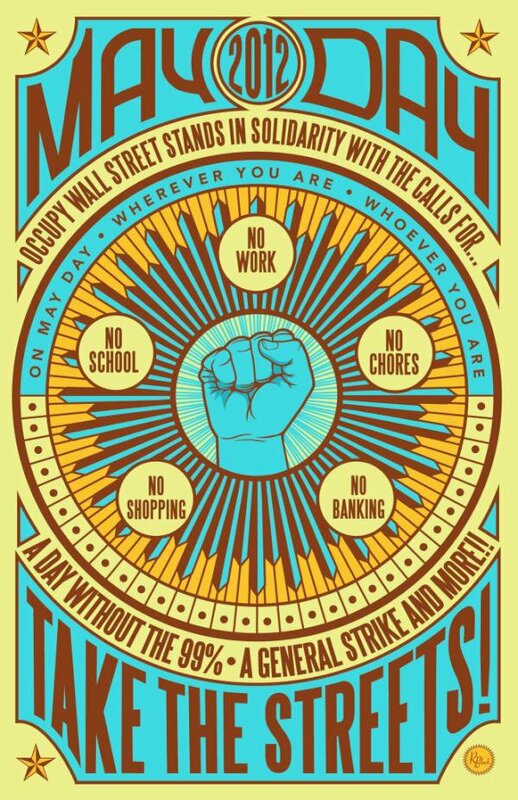 On May Day, wherever you are, we are calling for: *No Work *No School *No Housework *No Shopping *No Banking TAKE THE STREETS!!!!! The prospect of an Occupy general strike has been circulating for a while already. One of the several Facebook event pages devoted to it has more than 10,000 attendees. Occupy Los Angeles began calling for a May 1 general strike as early as last November, and Occupy Oakland joined at the end of January. Occupy Wall Street’s Direct Action group tried to take a strategic approach to the idea; though many of its members had little hesitation about calling for it, they took steps to ensure there was consultation, and therefore buy-in, among some of those whose participation would be vital. Since the beginning of the year, they’ve been holding twice-weekly meetings—with as many as 150 people crowded into a church or a union-office basement—which included labor organizers, immigrants’ rights groups, artists and anarchists. These meetings have focused at least as much on what to do during a day without the 99 percent as what not to do. In addition to forming committees devoted to shutting the system down, there are others for mutual aid, art, education and more. Perhaps one of the most promising aspects of a May Day action is the overlap with the May Day Coalition for immigrants’ rights, which has already been planning actions that day, and which has tremendous mobilizing power around the country—as the massive protests of 2006 showed. At the end of the January 11 meeting, an organizer of laundry workers, speaking only in Spanish, told the Occupiers, “Any campaign you have is our campaign.” The Occupiers, in turn, will have to demonstrate that the immigrants’ concerns are theirs as well. After one of the meetings, an original organizer of Occupy Wall Street looked around at her friends and said, “Look at us! We all have crazy eyes!” It was true; no one looked quite sane. But to call for a general strike in New York City in 2012, and to even begin to follow through on it, probably takes a bit of crazy. I am in full support of the Occupy movement, but seeing that myself, and 50 percent of america is employed by small businesses’, it is way to broad and frankly, a bad idea. If i didn’t show up for my work, were I am the lowest paid employee, but earn a good living wage, it would halt many projects we are working on. Stop being so radical and actually create a focus! This raises lots of important questions that have been discussed at these meetings. I know the feeling—I’m self-employed, and the only people who could care less if I miss a day are me and possibly the close friends with whom I collaborate. Going on strike for a day would be pretty anti-climactic. Yesterday, one woman at OWS told me that the non-profit she works for, which she really likes, has a big event on May 2 that she’s helping to organize. So, in that case, striking on May Day could be detrimental to something really important to her. That’s where the creativity comes in. It kind of reminds me of “giving up” something for Lent, among Catholics. Each person has to think about something in their lives that, to them, would represent a strike. But it’s not just personal; because this is part of a moment and a community, people also need to think of how they can contribute that day to building a better, more democratic, fair and festive world, along with other strikers. Obviously the OWS issues are less important to you than your business. Same for the non-profit worker. If you can’t see the impotency of that statement you’re probably not that concerned about the OWS issues. This right here. This attitude of “well, you must not care” is what is causing OWS to LOSE supporters. Sacrifices for what you believe in are one thing, but if that sacrifice destroys the life of yourself, your spouse and your children, it’s not an acceptable one unless EVERYONE affected gets a say in the matter. Anything else isn’t a sacrifice – it’s no better than what the 1% are often accused of doing. Secondly, Nathan is 100% correct. If you have something you care about, something that is important to you, and doing this would hurt that, then you *shouldn’t* participate. If you believe in the OWS, you wouldn’t be doing something to counter it anyway, so I don’t see how it can be conceived as negative, if someone has something else they feel they need to do. Caring about one thing over OWS does NOT mean they’re against it or any less dedicated than you or anyone else. This kind of prejudice is in the same vein as the prejudice that the 1% apply to the 99%ers – that we’re just noisy hippies trying to get a piece of their pie. Where there is a will, there is a way. Show up to work over the weekend and Monday so that you can pre-load your co-workers queues, making your absence less disruptive. Since all small businesses are included in the 99%, check with your boss. For all you know, (s)he also plans to shut down the shop and join the movement as well. I’m a small business owner and will be furloughing my employees on May 1st. The way I see it, the long-term implications this disruption serves to provide trumps any near-term project we will be working on. Since all of my clients are also in the 99%, they will understand if we don’t meet a deadline. I fully expect many of them will also be involved. Ed, I think this is a really good way of looking at the situation. Maybe people can take a vacation day – plan it in advance if they don’t want to just not show up. I think the BIG thing is NOT to buy anything and definitely NOT to bank. One day isn’t going to crash the economy but if everyone does it, it will show those in power that we have power over our pocketbooks – and that could be really powerful. Stop being so self-interested. Selfishness is one of the nation’s biggest problems right now. This is ONE DAY, and is intended to remind the corporatocracy that We The People still have power. Almost everyone has an excuse for not participating. Get on board, or stop pretending that you support the movement. What, you’ve never heard of calling in sick? hi, nathan: Each person has to think about something in their lives that, to them, would represent a strike. A strike is not a bit like Lent. A strike is a unified action or the visible signs of an action, in which one stops performing waged labor. If you make this simply an act of conscience, it loses most of its force, in my opinion. I have no idea whether calling a general strike makes sense, but defusing it at this early stage doesn’t seem to be very productive. Asking people to think of ways to make solidarity public on the day is perhaps more strategic? tat first line of mine is an introductory quote from you, to which i was replying. A general strike will only work if everyone and I mean everyone participates. Put aside your petty differences for the greater good, stand up united for a cause for the greater good. If you agree with the concept, then agree to be led by the leaders of the movement. Their is so much strentgh in numbers, when are people going to get that message that ” the workers , united, will never be defeated”! I find the implications of that comment a bit disturbing. It seems like that’s what always happens with “revolutions” – they just trade one set of masters for another. Many lefties seem a little bit too comfortable with the idea of top-down control, so long as its dressed up in pretty language. I agree with Chris – Occupy needs a focus. A couple of specific things that you can take to the average American/Canadian/Whatever and sell to them in a way that makes sense. There’s a lot of discontent with the corporatist model in the west right now. If you sound like a bomb-throwing anarchist or 1970s French communist, people are just going to tune you out and write off Occupy as a bunch of malcontents. It would be a shame if this opportunity was wasted (if it isn’t already) by handing it over to the usual suspects. Peace – will be represented by religious and spiritual groups. Just over 2 months is not a lot of time to get these groups on board. This IS education. Adult education. Anyone who promotes non-democratic overthrow of established governments or anyone who promotes violence and destruction is a provocateur. Strategies will have to be developed to control them. Kudos to the fantastic retro poster design! Please give the artist credit and consider a link for people to print this to post up in live locations. I like the general idea, but the “no school” is not well thought out. With how some authorities are reacting to protests, pulling your kids from school when they may get tear gassed is irresponsible. It also smacks of using them as a shield. Our city is reasonable, but I certainly would not take my 4 year old to Oakland or New york. I would have no problem keeping my kid home from school on May 1. This isn’t just a protest for fun – the plutocracy is gaining strength. What do you think the NDAA and the militarization of the police forces across the country are about? Step up and be heard while it is still safe to do so. I was at the Occupy Oakland General strike and there were many kids there. There was, in fact, a children’s march from the local library to the plaza. During the day if one simply avoided the radicals, who were obvious in their “non-conformist” black uniforms (funny how the Anarchists often dress like cops. Something Taoist about that…) the day was very peaceful. I marched all day, occupied the port, and left as it got dark in the evening. No violence or even visible police presence. It was a really really good day. And the kids there learned a lot more than another day at school would ever have taught them. I have planned to take off May 1 when I first heard a general strike was possibly going to happen, even if it doesn’t there will still be some activities going on for May 1. Most small businesses are part of the 99% so maybe they could join for a half day and work longer the day before and after. If you can’t join and you haven’t moved your money out of the too big to fail banks maybe you could do that. Maybe the weekend before you could flyer to let other people know about the event. If you can’t refrain from these things then you probably aren’t all that committed to the movement. It’s quite possible that the movement doesn’t really matter to you. You do realize this “all or nothing” attitude is how the USSR got created, right? “If you’re not with us, you’re against us.” is one of the most dangerous things that can be said, especially when OWS is supposed to be a peaceful movement. When the lives/wants/needs of the supporters become less important than the movement, you need to reexamine the basic principles of that movement lest you trample over your goal and end up with something worse than you had before. This is a logic-free zone. convincing 2 others to participate, which would help a lot. There’s no getting off the hook. You either show solidarity or you don’t. Make arrangements but don’t make excuses. SOLIDARITY FROM GREECE! 1st of MAY GLOBAL GENERAL STRIKE WILL BE THE STARTING POINT FOR GLOBAL SOLIDARITY! I am totally on board with no banking or shopping as I do as little as possible of these things in my usual daily affairs. However, what if I love my work because I see it as being consistent with the values of the movement? I care for an 88 year old man with Alzheimer’s disease. I provide direct service to him privately on a 1:1 basis so that he can continue to live on his own, for example; helping him stay organized and oriented in his home. There are no 3rd party payers or middlemen involved. I take a train into the city on a prepaid monthly ticket so I would not be buying anything. How would my not being there to support him serve the movement? Isn’t my situation an exception? Also, if we are about equity, how does not patronizing a local small business who is consistently serving the needs of those in the community, serve our purpose? For example, we normally go to a local restaurant for breakfast where our need for nutrition is met for a reasonable price. I could and would be willing to forgo this for a day as I understand the larger complexities of the supply chain and such, but I do make a distinction between corporate capitalism, large corporate entities, and the reasonable use of money as a practical mechanism for the exchange of value when providing a particular product or service. I support the movement and raise these questions because my understanding is that there are no leaders… just us! My understanding is that we the people are committed to this very process of participatory democracy, consensus building, and keen discernment. So I say that we better be very clear in our thinking because our results will reflect it accordingly. If you go to work you’ll be doing the opposite of “no work”. All excuses weaken the impact regardless of their justifications or merit. If you shop you’ll be doing the opposite of “no shopping”. All actions are voluntary and everyone will choose how they will show support. world government. Remember how Karl Marx allowed 3 of his children to starve to death rather than him going to work to take care of his family. Why should we all not have that kind of dedication to this cause? I mean really, the next thing you might expect is for someone to take care of you in your old age. Hyperbole distracts from the sentiment. Many others and I are 4 square against that globalist agenda 21 for example.
. I am not in favor of destroying our environment or seeing people being treated as a simple resource to be used and abused. I am also not in favor of totalitarian government. Are you aware of “Executive Order Number 12148” or The plan called REX 84? Invoking the FEMA camps going into operation. I just do not want to see any reason for the (Abomination / Obama-Nation) to make the foolish decision to declare martial law and try and confiscate our legal ability to defend our freedoms. If you want to do something good, then why not Vote Ron Paul? This comment meets your criteria “comments constructive and relevant to the above post. Digressions, personal attacks, hateful language, and unsubstantiated claims” The proof of your intent will be if you post it. There probably is something in there that needs correcting but most of us don’t have the time to go through it. A quick scan shows the date July 20, 1979. This doesn’t appear to have much to do with the current U.S. administration nor is there any indication in your post that there is a threat that it will be abused. If you know of something please post. I’m all for a strike!! I’m gonna Strike the ows loosers in the head! On May 1st, 2012, I’m gonna spend $100 at each of 10 businesses as a counter-protest. And I also have a proposal for the next OWS direct action: #occupycheckbook. According to a recent issue of Consumer Reports magazine (with the bank fees cover story), about 87% of Americans don’t balance their checking accounts. Tracking one’s own spending is a good, grassroots way of closing the wealth gap. strike is not a good way to solve problems. We need more objectively approach to such topics. soo where can i do it please help out.